Monument to the Revolution (Spomenik Revoluciji) is a World War II memorial sculpture by Dušan Džamonja, located at Mrakovica, one of the highest peaks of Kozara mountain, Republic of Srpska, Bosnia and Herzegovina. It is dedicated to the fierce battle and 2.500 Yugoslav partisan fighters and 68.500 mostly Serb civilians killed or deported in Ustaše concentration camps during the Axis Kozara Offensive led by German and Ustaše military forces from June to July 1942. 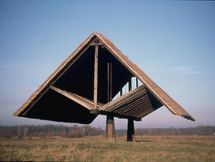 Initiative for the Monument construction began in 1969 and Dušan Džamonja won the first prize at the anonymous Yugoslav competition in 1970. 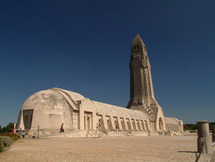 Construction of the monument was completed in 1972. Džamonja himself described the Monument as the game of light and darkness; this cylindrical-shaped Monument is composed of twenty vertical segments and every of them is characterized by deep steel-covered bulges (positives) and hollows (negatives). While negatives symbolize death, positives represent victory and life. Horizontally sited concrete blocs are the symbols of enemy forces who are trying to destroy life and victory but are unsuccessful. Other parts of the memorial complex are the Museum and the Memorial wall with the names of 9.921 Yugoslav partisans killed in fightings on Kozara during the World War II in Yugoslavia. Džamonja designed the complex as a story, which visitors experience during a walk throughout the whole area. At the tourist complex entrance, where the statue is not seen yet, there is a filmic atmosphere. Hotel complex is a typical Yugoslavian architecture of buildings in hilly areas, it has not changed much since it was built. The view from the hotel and the platform in front of it are not directly connected to the statue - but to a glorious stairway that points out the meaning of the statue. The stairway's view from the lower grounds is lost in the woods, in the dark. The element sequences of opening, closing and at the peak, opening again, creates an incredible experience. In moments like this, the question appears: Is the sculptor directing our emotions and feelings? He subordinated the stairs to the terrain and vegetation in a way that trees appear in front of you, as you walk towards the statue and obstruct the view – you feel your subordinated position. This solution gives the impression that this arrangement has always been there and it fuses with the surroundings. Stopping on the way to the statue and looking back offers the views of composition art of concrete circles in different sizes filled with grass surface – the lowest and biggest circle servers as a welcome round. The statue is seen at the end of the stairway behind two trees, where the path splits in two and embraces the statue from both sides. At this point the dramatic climb ends, which is preparing you on the moment, when you see a meadow as a carpet of the statue, as an element of emphasizing. The concrete parts on the ground, surrounding the statue create new views, which can feel very brutal if you are standing between two. The spaces between these parts have different depth, that is why the view of the statue can be different, depends on where you are standing; on some places a person can get lost in the heights. Behind the statue there is a labyrinth of concrete walls – occupation on one side and physical block on the other, and in between the central part of the statue. On the labyrinth walls you can see the names of fallen victims. When the statue was built, it had the largest number of victims names written down in whole Yugoslavia. The statue and mostly the labyrinth are interesting because of it's different concrete textures, which tell us that the author also dealt with smaller details. Somewhere the textures change horizontally, as interlacing of smooth and coarse concrete, and somewhere even whole surfaces appear in smooth or coarse concrete. Making sound in the centre or near the statue creates different sound sequences. The statue with its surrounding is planned to make us feel and experience all different types of feelings. The statues is build in cylindrical shape with different elements, that offer different associations from different perspectives; in particular moment, it looks like trees growing upon each other and blending with the forest behind it. The inside of the statue is accessible to visitors, who can pass the narrows slots, that can feel very claustrophobic. The shadows that fall on the walls remind us of weapons – triangles, that point at you with the sharpest angle if you stand in the middle. Looking above, appears a beautiful scene – sprocket wheel, which continues into concrete walls – association to the Sun – surroundings as element of tightness and Sun as hope, looking into the future. Virtual roller that statue is shaped in is in parts where they are joined (the statue with the virtual roller, that surrounds it), dressed in metal facade panels suppressed in concrete, so it makes the experience even more intense. The metal shines in sunny weather. Some hundred meters from the statue you can find Memorial museum, which is compactly installed in the entire complex – it replenishes it in content and composition. It stresses the relation between the inside of the structure with the forest – the view through the glass surface where exhibitions are set (in this forest the battles happened, for which the statue was built for).